Siemens is set to acquire MRX Technologies Group, headquartered in Perth, Australia, to further expand its offering in the field of predictive maintenance based on digitalisation. The Group is comprised of JRB Engineering Pty Ltd., MRX Technologies Ltd., MRX Rail Services Pty Ltd. and MRX Rail Service UK Ltd. The parties agreed not to disclose financial details of the acquisition. The acquired company will be managed as a legally independent firm within the Siemens Mobility Division. Closing of the transaction is expected early in July. The MRX Technologies Group has been offering services for manufacturers and operators of rail systems since 1996. The company has a comprehensive portfolio for the digitalised condition monitoring of rolling stock components and rail infrastructure. It delivers extensive measurement data used to optimise the maintenance of rail systems and make them more cost-efficient. The predictive maintenance of rolling stock and rail infrastructure is gaining in importance. Operators today demand 100% availability of their rolling stock and infrastructure, since failures cost money, cause delays and the annoyance of passengers, transport purchasers and freight customers. Rail operators are increasingly shifting responsibility for maintenance to the rolling stock manufacturers. As a result, orders for new rolling stock are often coupled with long-term maintenance contracts, at times extending to the end of the planned system lifecycle. Siemens holds a leading position in the rail industry for supplying rolling stock, infrastructure and services from a single source. 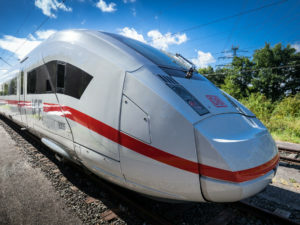 As the first company in the rail industry, Siemens operates a special centre in Munich, Germany – the Mobility Data Services Centre. Masses of data continually collected and transmitted from rolling stock and trackside equipment is analysed in a central diagnostics system at this centre. On the basis of these analyses, early forecasts of system failures are made and recommendations for acute or scheduled maintenance are sent to technicians in the Siemens depots as well as to the operators. FOR ALL THE LATEST INFORMATION, NEWS, IMAGES, VIDEOS AND ARTICLES ON ALL ASPECTS OF DATA SYSTEMS, PLEASE CLICK HERE.